I realize that my posts have been rather sparse of late. I beg of you my faithful readers, think not it's due to a waning of my passion. The fact of the matter is, I have been on the road a bit recently and access to Internet has been minimal, if not sketchy at best. I have alot of posts that I'm working on and will be rolling those out in the not-too-distant future. In the meantime, I leave you with a picture from my recent travels that captures the essence of South Louisiana! 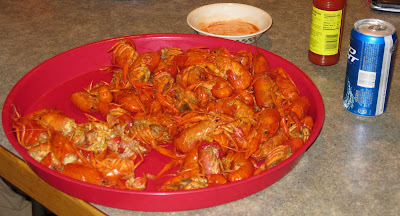 Crawfish - Hot Sauce - Cold Beer - ma sha it don't get no better dan dat!! !